Many people think freelance isn’t for them because of the self-discipline needed to get up in the morning and actually do some work instead of doing other stuff in the house. After all, when you have a home office, it might be hard sometimes to separate work from home, right? Today, I’ll share some insights about freelance working hours and how having a set work schedule helps you better manage both your time and your work. Fixed freelance working hours increase the productivity. I hear you say “what do you mean fixed working hours? That’s what I am trying to avoid when leaving the office and going freelance?!”. Truth but not entirely. Firstly, as freelancers we have the freedom to decide which part of the day to work and how much. Secondly, we can always skip a working day or be late for work for whatever reason. 😉 Setting aside fixed freelance working hours is for planning purposes. It aims at increasing the productivity and better time management. This way, we avoid splitting our time during the day too much and risking to finish nothing end of the day. 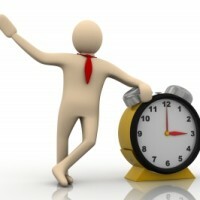 The sooner you finish your work for the day, the more free time you’ll have afterwards. I liked sleeping till noon and getting up early in the morning to go to the office was my worst nightmare. However, there are a couple of benefits of setting freelance working hours, especially if they start early in the morning. Now I love (most of the time) waking up in the morning, having my coffee relaxed at home and being online ready for work at 9 am. This practically frees up most of my day. For instance, if you make it a habit getting up as early as 8:30 am, starting work at 9 am and working until 1-2 pm, you have your afternoon for various activities – sports, walk in the park, meeting with friends or whatever else you like doing. These are 4-5 hours active work, during which you’ll get done more tasks and you will have more free time afterwards if you had woken up at noon and go out from time to time and work in between, right? Think about your health – work during the day, sleep at night! Don’t turn the day into night and vise verse. The freedom to not go to the office could tempt the “night owls” to work at night but I think that’s not a good idea. Firstly, you’ll work only with bad light and you risk worsening your eyesight (it’s bad enough we work on the PC all the time!). Secondly, you risk to isolate yourself from family and friends, because they sleep at night and play during the day while you work at night and sleep during the day. Maintain your social life – it’s especially important when you lack colleagues to share your morning coffee with. Be consistent so your clients can rely on you. If you have fixed freelance working hours and get up early every day, you develop working habits and are available to your clients at certain times on regular basis. This way they know when you work and when not; they have their expectations and know when to turn to you for help, advice and more importantly – know when to expect your reply. For example, if your working hours are all over the place, you risk being bombarded with “important” and “urgent” requests all the time and if you cannot meet an unrealistic deadline, the clients are not happy. However, if you work Monday through Friday, 9 am to 2 pm, your clients know that if they email you on Saturday – they’ll hear back from you on Monday morning; or if they have an urgent request – they’ll communicate it with you first and not just set the deadline to yesterday and then be upset for not meeting it. Don’t overwork yourself – plan it! Fixed freelance working hours helps you better plan your work and to always meet your deadlines. Remember that you are freelancers and your clients are looking for results, not daily reports. Fixed working hours would help you better plan your workload for the week, not just the day. Back to you – what do YOU think about having fixed freelance working hours? Thanks for your comment, Ashley! While i am not sure what does “flaky” mean in this context (eccentric?) – my experience shows that the only important thing for you as a freelancer is to remain true to yourself. Then, whatever personality you have – there always will be clients who match your personality and want to work with you. The worst move would be to try and please everyone… Have your principles, stick to them, be yourself – it’s the winning formula. Great article Diana. When I started out as a freelancer I had all these visions of me getting up late, doing a bit of work and then floating around doing what I liked for the rest of the day… The reality just isn’t like that! I probably work more hours per day now than I did in my day job (difference is, I actually like this work so my day goes quicker). I think the key here is that freelancing gives you the freedom to take a day off or do whatever you want EVERY NOW AND AGAIN – not every single day 😉 Thanks for another great post. Your tips really help me lot as freelancer.